MoJo’s on the Harbor is a stunning destination for a meal or a Happy Hour drink and light bite to eat with a prime waterfront view. 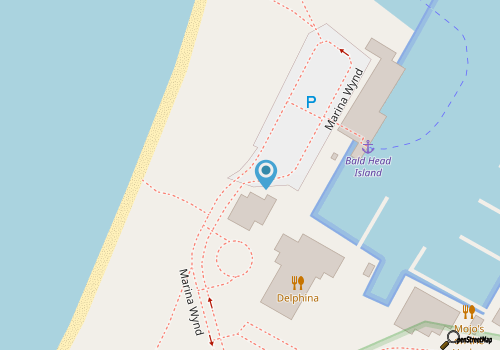 Overlooking the adjacent marina, and featuring vistas that extend from the nearby boats to the famed Old Baldy lighthouse, this inviting destination is a nice introduction to the beachy landscape of Bald Head Island. The restaurant is easy to reach from the ferry or the adjacent marina, and boasts a unique and eye-catching nautical interior with high beamed ceilings, a central bar that’s creatively decorated with dollar bills, and seasonal outdoor seating for a prime waterfront view. The menu is divided into lunch and dinner categories, and features lots of coastal selections for each mealtime. For lunch, diners can dive into a classic oyster or shrimp Po’boy, a fresh fish taco, or a Grouper BLT with Jalapeno Mango Mayonnaise. Dinner is just as coastally inspired, with entrée selections divided into “Seafood” and “Not Seafood” categories, which includes unique spins on local classics like Lion Fish Tempura, Pistachio Crusted Mahi Mahi, and fried seafood baskets with regular or sweet potato fries. With a fun ambiance that’s perfect for summertime cocktails, MoJo’s on the Harbor is a great spot to toast another beach day on Bald Head Island.